I have latest version of Ubuntu Linux LTS server. 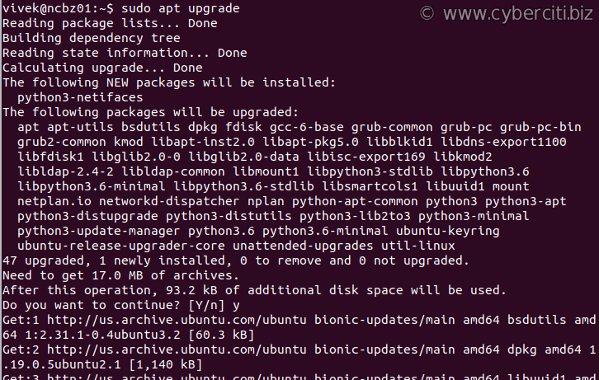 How do I update Ubuntu Linux for security and application fix/upgrades using ssh command line? How can I install updates via command line option? apt-get or apt command – apt-get command or apt command is the command-line tool for handling packages. aptitude command – aptitude is a text-based interface to the Debian GNU/Linux package system including Ubuntu Linux. Let us see all commands and options. 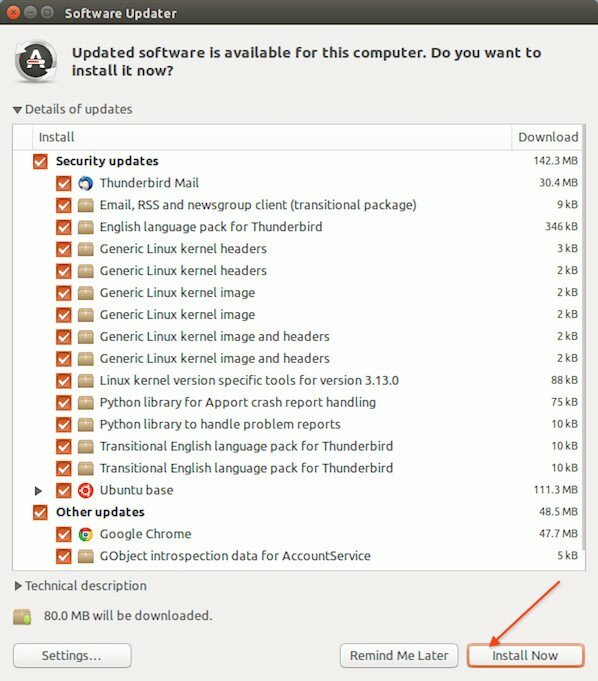 apt-get update : Update is used to resynchronize the package index files from their sources on Ubuntu Linux via the Internet. 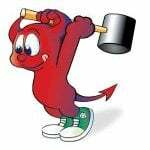 apt-get upgrade : Upgrade is used to install the newest versions of all packages currently installed on the Ubuntu system. apt-get install package-name : Install is followed by one or more packages desired for installation. If package is already installed it will try to update to latest version. First, open the Terminal application and type following two commands (Application > Accessories > Terminal). Please note that above two commands will fetch files from the Internets or local mirrors. The location of update pages is specified in /etc/apt/sources.list (repositories). You need NOT to make any changes to this file until and unless you need extra repositories for your setup. The dist-upgrade in addition to performing the function of upgrade, also intelligently handles changing dependencies with new versions of packages; apt-get has a “smart” conflict resolution system, and it will attempt to upgrade the most important packages at the expense of less important ones if necessary. So, dist-upgrade command may remove some packages. The /etc/apt/sources.list file contains a list of locations from which to retrieve desired package files. 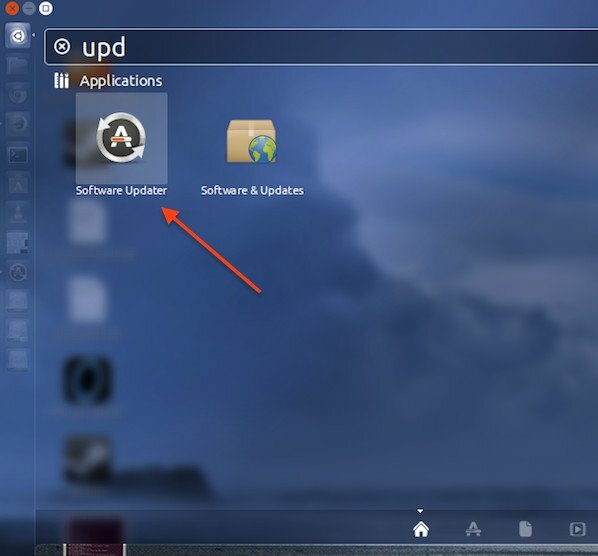 How Do I Update Ubuntu Linux Softwares Using Command Line? I installed ubuntu sofware in my laptop but I can changed the display of monitor (the evolution of screen is only 1240×768). I want to change it into 1240×800 to fit with the widescreen. So what do I do to change it. I want to have vietnamese font in ubunto? please let me know the way to get it! I installed the ubuntu 7.10 versiyon.At the beginning Ä± can not connect the internet then find a way and mozilla can connect the web.But there is a problem about updates Ä± have not a web connection for doing updates.no problem about modem no problem about networking and mozilla work good but other application like pidgin and updates do not connect web.What can Ä± do? Try updating your software sources. 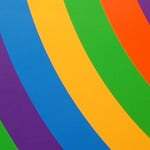 Go to linux ubuntu website and search for software sources. I had this problem similar to this with my Pidgen. I had to change the server addresses for my Yahoo chat to work. But you go to System>Administration>Software Sources. Hope This Helps You…. 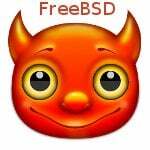 I cannot update my Feisty 7.04 and don’t have GUI on the server! How can I do any updates at all? apt-get update returns a lot of errors but downloads some things? I do not know what or where? and apt-get install update does Not work and gives me E: error ! I know now that ubuntu has abandoned the 7.04 version and has changed the link/ulr so the server cant find the files it needs (to download). but when I try to put a correct link in my sources.list file the errors continue!? Does anyone know how to Manually install the updates??? Now if Microsoft had change the URL, we would never hear the end of it, that is only fair not to mess with the configuration files on a fairly new operating system (feisty 7.04 is not that old at all, compared to NT is a new born baby)! Working Ubuntu server from the command-line, this help was very useful. I the speed of updating is so slowly,what should i do to update faster? if you update your network settings and if you are getting IP address from DHCP you can run dhclient eth0 (or whatever NIC) and update the net info. this will improve your speed. If you are in the Graphical mode (GUI) then you can browse the cdrom to see what program is executable (usually install.sh or similar program). If the CD is a linux program then a shortcut (link) to it will appear on your desktop. There are usually a link (or shortcut) to the CDROM in the root of your drive, if there isnt then you have to cd /media then cd cdrom . (after you load the cd in the drive) then you can do an ls to see any install.sh program or README file to tell you how to install that program. Great stuff, but can you upgrade just a single package eg. phpmyadmin only? Very good if you have a working system! But mine is not working so I can’t up date cos my upgrade is not completed until the desktop is updated and running. So do I just re-load again or have I misses some thing? How can you install a windows program on ubuntu? firstly you must install wine. after you can install windows program together wine. I am not an expert in Linux but I think you have to use the fdisk program in linux to create an NTFS or FAT32 partition so you can install Windows on it. OR if you already have an unused partition (empty) you can install Windows on it. but take extra care not to format the linux partition. IF your Linux system does not come up correctly you can type fsck to fix it. There may be a suitable alternative to your Windows program, depending on what it is. There are lots of choices as far as open source software goes, you might get lucky. You might also be able to use Wine, a Windows Emulator to install and run your Windows program, again, depending on what program it is. It’s been great with the Karmic. I’m using it almost anywhere. And it does work like charm after install.. And right now i’m learning the command so i can setup my own server box. Mehdi, you are a great guy, always trying to help others… So i want to add a bit on what mehdi talk about. I can run my warcraft & Counter Strike that reside on my NTFS(windows) partition just like that. WINE is really a great program. 2. U don’t need fdisk all the way to manage a partition. Use gParted instead. Shrink the partition. make a new empty partition and boot up the windows cd and install windows. then configure the GRUB loader to boot your windows as well. after installing packages how can i see the list of the packages or files that were just install? I am talking use terminal commands? I am very new to ubuntu linux, I was wondering, if I have Ubuntu and I want to upgrade it to the next version, will the drivers (and etc), get updated (or at least stay there) as well? Or do I need to install one and each of them again manually? If you have a computer which is running Windows then I suggest to use the Wubi which is a small file but installs the latest version of Ubuntu for you (without making changes in your file allocation table or boot sector and you will Not lose any of your Windows files, and it defaults into Windows with Ubuntu as 2nd choice). As for the updates and upgrades Ubuntu has a program which comes up automatically and asks you to verify username/password and then it updates it regularly (You can turn that option off or set it in longer intervals), Otherwise you can do it in terminal by sudo apt-get updates or upgrade. I had a bit of problem with the Auto Updates (In GUI) with version 10.x, I have not had any trouble with (the auto-updates) in this new (11.x ) version so far and I have been using it for few weeks now. In the last version it would totally freeze the computer and the last time it froze I lost everything (of course it was a learning machine and I didnt rely on it for anything) But then other people told me they had same problem (in version 10.x). So to be on the safe side, try to use the command line for updates and upgrades. Also I think with updates you update the lib. files and some drivers but with upgrade you upgrade the kernel file?! I am having troubles updating my 7.04 Feisty. I am trying to update to 11.04, but am not successful. I have the CD for it, and every time i run it, it takes forever, and doesnt seem to do anything. After a while, at the bottom, a few numbers and file names appear. it counts up from 1, and just keeps going up every second. It reached 8500 until i turned it off. Why will 11.04 get installed? I used to have the same problem with updating, it was my hardware I think , I used different method of installation (used all the different options) but nothing worked. Have you taken different options to see if it works? Do you have enough Hard Drive space left for an update? Anyway now I do a partition-less install using Wubi but that is an exe file and only works in Windows. If they have something like Wubi for Linux, it would be excellent cuz it works great. (May be you can use Wine to run Wubi inside Ubuntu)? it is a 1.4 meg file but it picks up the latest version of Ubuntu for you and installs it. I did a mistake when I was running some programs. By mistake I pressed the update button on the software update page. Immediately I pressed the cancel button to cancel the update installation. But I didn’t able to cancel it. Then I pressed the shut down button immediately. After that when I started the computer, I didn’t able to open the computer anymore. it shows some spectral line on the screne. Please give me some suggestion. Thank you. It’s writing command not found on my machine. I used to have the same problem with updating, and lose sound and other software by the way it was my hardware, I used different method of installation with network connection and I used all the different options and all worked. I was hoping to see some sort of a window GUI screen after installing and updating! you ,might want to try holding the Alt key then pressing F7(or shift alt f7) to see if the windows already loaded. hopefully someone else will reply. hopefully one of these days I’ll get me a job then I can get back into working on linux…. apt-get upgrade tip was very useful! Thanks. what should i do to upgrade my system? 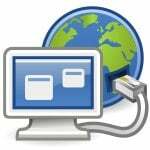 The official ppas never have the latest software, is there a way to update all the applications i have installed without having to go to each ppa site to download manually ?